Armstrong Steel Buildings, Colorado’s fastest growing construction company, announces an innovative approach to doing business, the acceptance of cryptocurrencies as a means for customers to purchase pre-engineered steel building systems. Essentially, cryptocurrencies are a decentralized digital medium of exchange in which market value is based on volume and demand rather than traditional metal-based currencies or currencies which are controlled by national governments. Forward thinking companies across the globe are beginning to accept the currency as a form of payment – including Virgin Galactic, eBay and Overstock.com to name a few. Bitcoin and Dogecoin are the two cryptocurrencies that Armstrong Steel is currently accepting but other forms of cryptocurrencies will be added to the company’s payment list as those currencies gain momentum. “Cryptocurrencies provide an additional security protocol for our customers that they wouldn’t have if they were to pay by check. It also speeds up the transaction process for the buyer, which we believe is something our customers will value,” says Chumley. Armstrong Steel Buildings is known for thumbing its nose at the way the ‘good ole boys’ of the steel building industry do business. The company’s website, www.armstrongsteel.com, is a qualified departure from the stagnant web presence of its competitors. Conversely, the company boasts a return to the outdated ‘service first’ concept as a business model. “Our customers are viewed as people who have real lives, our sales and support teams are taught to nurture relationships based on that fact,” Chumley offers. 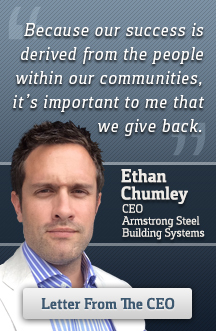 The juxtaposition of old school attitudes and advanced technology has allowed Armstrong Steel Buildings to grow 1400% over the past three years.